This statement mirrors what most educators and corporate trainers say when questioned as to why they choose not to address soft skills in their training programs. The statement, “I cannot teach soft skills” is a self-fulfilling prophecy and it means “I cannot.” That is that, end of discussion. The statement, “I cannot teach them a positive attitude,” is, in itself, an example of a negative attitude. Let’s take the positive approach. Try this simple exercise. “I can teach my employees how to have appositive attitude.” Now doesn’t that feel better? We have moved from the negative to the positive, from impossible to possible, from hopeless to hopeful. Remember, if you do not believe it, then how will anyone else believe it? Step 1-Identify the Competencies of a Positive Attitude. Let’s identify the competencies for a positive attitude. The way one thinks or feels about something is known as one’s attitude. 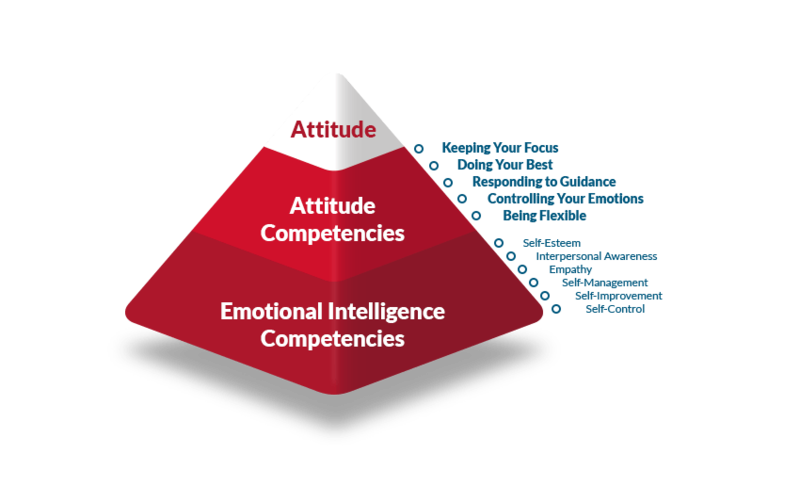 The underlying competencies of attitude are key emotional intelligence traits that must be possessed in order to help build a positive attitude. Each of these emotional intelligence competencies can be learned and developed into positive personal habits. Next let’s take a closer look at the core competencies of a positive attitude. This is perhaps the most important step of them all for helping your program participants to develop positive attitudes- model that behavior yourself. Behavior modeling is the proper demonstration of a desired behavior. According to the theory of behavior modeling, we learn not only by doing but also by watching what others do. So if you want to have someone learn a positive attitude, you must model that behavior yourself so that others can see how it is done. Video modeling is a relatively new concept in behavior modeling. It is simply the proper demonstration of a desired or targeted behavior that is recorded in a video so that it can be viewed multiple times, especially in the real world in real time. The use of smart phones and tablets makes this a very popular and effective method of behavior management. Once the competencies for developing a positive attitude are understood the next step is to teach your participants how to develop them into good habits. A habit is a behavior that is repeated often without thinking about it. Repeat these steps until the desired behavior becomes habit. In summary, there is no reason to say that you cannot teach a person to have a positive attitude. It is simply not true. What is true is that, if you follow these simple rules about changing a negative attitude to a positive attitude, you will change a person’s life forever, in a very positive way.